The Sueno del Mar Dive Center offers a full range of SCUBA diving expeditions for certified divers, visiting 20 different dive sites over the course of 7 days. Sueno Del Mar’s fast boats leave the dock three times each day with the most distant dive site only 15 minutes from the shop; you spend your time diving and not riding to your dive destination. Wall dives, coral fields, and wrecks are all located within Roatan's Marine Reserve and make for an abundance of marine life. Thrilling night dives can be arranged to accommodate divers who relish the array of life to be seen on the reef after the sun has gone down. We offer specialty trips to dive destinations located on both the north and south sides of Roatan, Cayos Cochinos, Barbareta, and off the tiny island of Helene. Personalized snorkeling and kayaking instructions are available, as well as guided snorkeling and kayaking tours for small groups looking for individual attention. The friendly and professional staff of Sueno Del Mar Dive Center will show you the beauty and incredible fish and coral life along the world’s second largest barrier reef. Whether you are a veteran diver or a novice, Sueno Del Mar Dive Center will make your Scuba diving vacation one of the best ever. Sueno Del Mar Diving Centre offers professional PADI Scuba diving lessons and certifications from Open Water through Dive Master. We also specialize in open water certification and referrals for people who have completed their academics and pool work at any recognized PADI course and are looking for the ideal Caribbean conditions for their first open water experience. We offer Dive Centre courses for those who want to experience the phenomena and thrill of diving and refresher courses for certified divers who feel the need to brush up on their skills. Our dive shop is the most complete in Central America with top brands and guaranteed lowest export prices! The Sueno Del Mar Diving Resort offers rooms in our new luxury facility on the beach and we team with the Roatan West End Hotel to offer accommodation / diving packages. 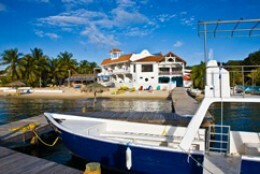 The Roatan West End Hotel is located a short walk from the Resort in the heart of West End. So come and spend your next Western Caribbean Scuba diving vacation with us. We can arrange just the right dive/hotel package for you at either the Sueno del Mar Resort on the beach, or at the Roatan West End Hotel in the heart of West End Village.